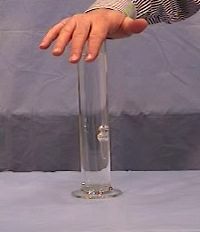 The diver-shaped glass in the cylinder has a small hole in the bottom. When pressure is applied to the rubber membrane covering the cylinder, more water is forced into the diver, causing an change in its average density. When this density is less than water, the diver will float; when it is more the diver sinks. Done carefully, an equilibrium point can be found where the diver is suspended in the water. 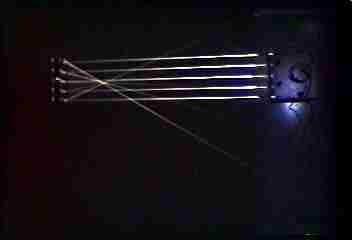 A stream of electrons will be bent by a magnetic field. The lines on a CD are close enough together to act as a diffraction grating and separate light into its constituent colors. When a two dimensional object is vibrated, patterns of waves can be seen. The sand on the plate collects in the nodes, or areas of no motion, of the waves. On a concave mirror, the light is reflected back through a focal point. Curved mirrors obviously distort the image. For a concave mirror, the image will appear right-side-up. A bulb has two probes that make an open circuit when initially plugged into the socket. Placing the bulb into ordinary tap water does not complete the circuit. 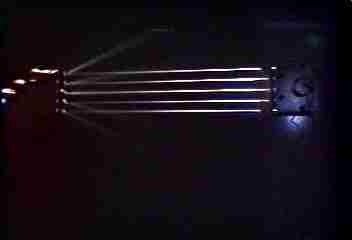 However, add a dash of salt, and the ions are free to carry current, closing the circuit and making the light glow. The more salt, the brighter the bulb. Two concave mirrors facing one another can be used to create a hologram. Perhaps this is how some people produce ghostly images? A drop of food coloring is placed water at the top of a glass loop. 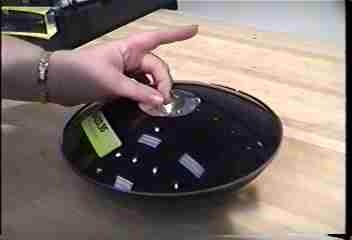 When one corner is heated, a convection current is started and the food coloring will move around the ring. On a convex mirror, the light is reflected back through a perceived focal point situated behind the mirror. A converging (convex) lens focuses light through a focal point before creating a magnified image. A moving, spinning ball will curve due to the addition or subtraction of pressure effects. The side that is spinning in the direction of the motion will have a higher pressure than the side spinning away, thus the ball will curve to the low pressure side. Due to the small slits in a diffraction grating, light can be broken down into its constituent colors. 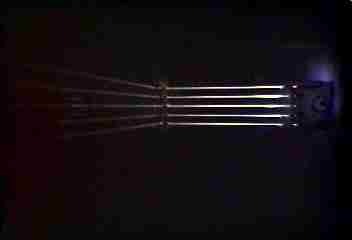 For this source, there seems to be three distinct lines; a red/orange, a faint green and a faint blue. Pyrex and Wesson oil have the same index of refraction. Thus, a small test tube filled with oil set into a larger container of oil will "disappear". A diverging (concave) lens defuses light. 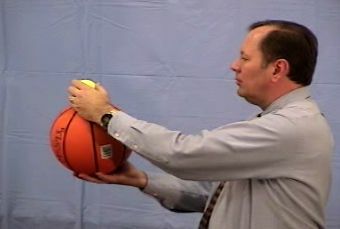 A tennis ball is held in contact with a basket ball, then the two are dropped as one. The basketball has a higher momentum since is has a higher mass. When they hit, the momentum"switches"; i.e. 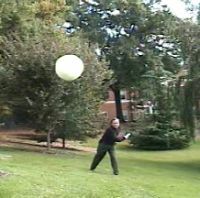 the tennis ball has a momentum equal to that had by the basketball before the collision. The effect is a very fast moving, high bouncing tennis ball. Look carefully; the center of mass of the cone is actually rolling down hill. An optical illusion makes it look like its rolling up. 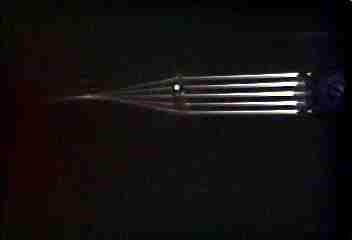 A tuning fork, when slung, will illustrate the doppler shift in frequency. 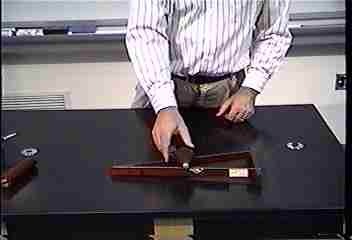 The frequency goes up when the sound is moving towards you while the frequency goes down while it is moving away. .
A tuning fork, when rotated, will give a "vibrating" sound illustrating the doppler shift in frequency. The frequency goes up when the sound is moving towards you while the frequency goes down while it is moving away. .
A whistling reed, when rotated, will give a "vibrating" sound illustrating the doppler shift in frequency. The frequency goes up when the sound is moving towards you while the frequency goes down while it is moving away. . The frequency of the car's horn goes up when the sound is moving towards you and goes down while it is moving away. The frequency of the car's horn does not change when you are traveling at the same speed as the source. The frequency of the approaching car's horn goes up when the sound is moving towards you and goes down while it is moving away. Notice that the frequency change is higher in car 2 as compared to the sidewalk. As the liquid evaporates from the head of the duck, the liquid in the duck heats up (towards room temp) making it rise up the duck's body. When it passes the CM point of the duck, it tips it over, getting the beak wet again. The cool water cools the liquid and the duck stands back up.